Back in the shed at last and glazing work that hs been waiting o be fired forever. An unexpected visitor today, most welcome, but gave me a start when all I could see was the head sticking out from behind the kiln. 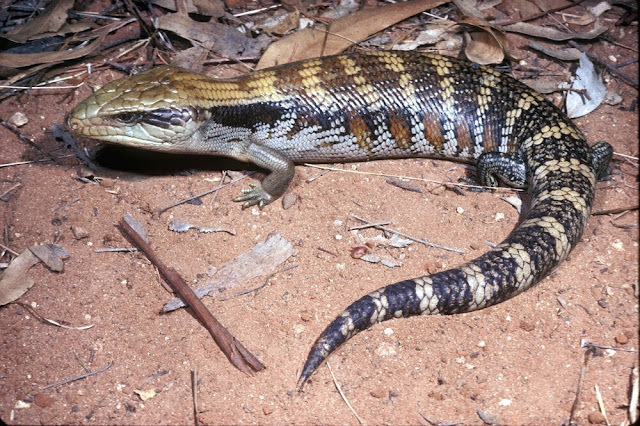 An Eastern Blue Tongue Lizard. I hadn't seen one here before so am very pleased to have it visit. One look at me and it took off, I think it was calling the shed home in my absence. There are a lot of pesky snails who congregate in the shed so Mr Blue Tongue was looking for them I believe. The photo is by Peter Robertson of Wildlife Profiles on the Museum Victoria site. 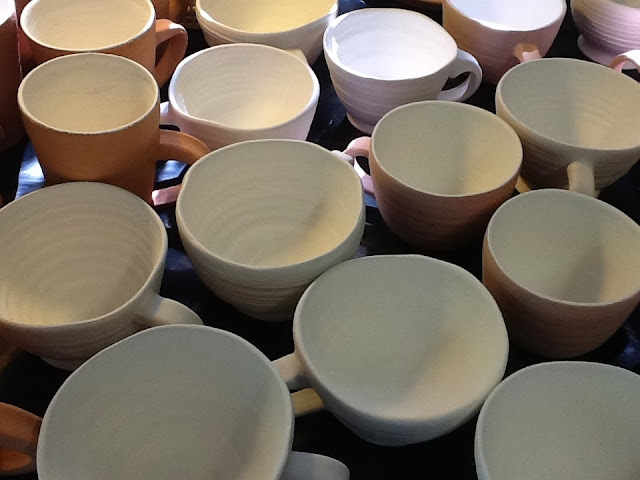 Yesterday my dear potter friend, Kim Aitken, and I drove to Gympie after visiting The Clayshed at Maroochydore where I bought a bag of Imperial Porcelain for the amazing price of $35!! 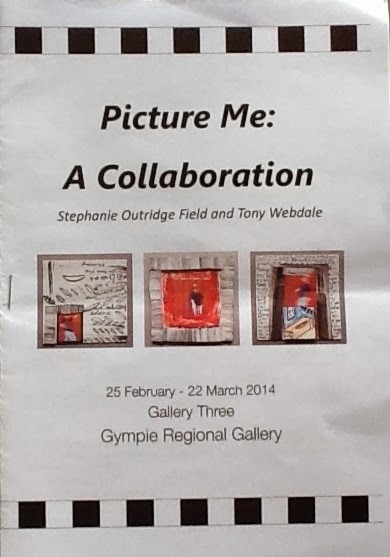 At Gympie Regional Gallery is an exhibition called Picture Me: a Collaboration between ceramicist Stephanie Outridge-Field and photographer Tony Webdale. A very colourful and lively exhibition combining ceramics and photography as well has focusing on the individual art forms. An exhibition on at Griffith University is from their collection of works donated by Len Cooke formerly from the QAG with ceramics included in the collection. This will be well worth a look. 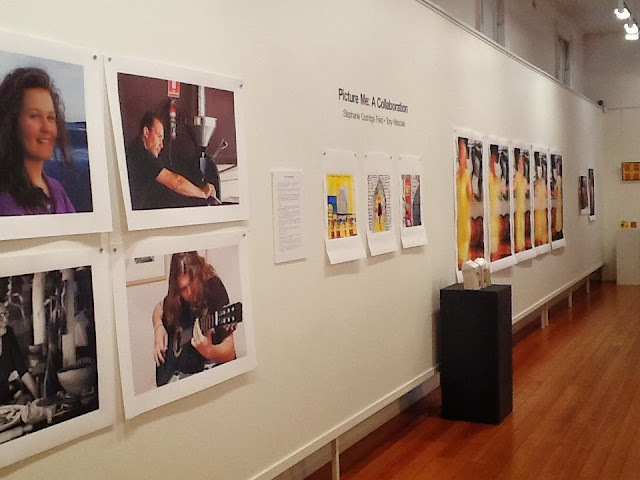 It is on until March 29th at the Queensland College of Art Southbank Campus. 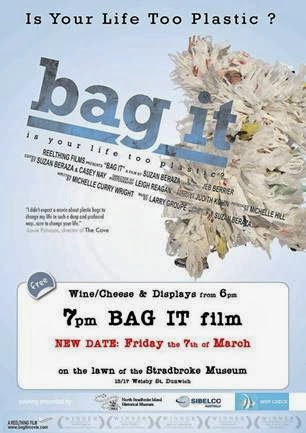 Tomorrow night at the North Stradbroke Island Historical Museum is a film about plastic which I hear is good called Bag It. I'm sure ill have to put my hands over my eyes when it comes to seeing the turtles!!!! Better get back to the shed there are pots to glaze, burners to scrape and a new porcelain to experiment with after I get everything in the kiln. Labels: Eastern Blue Tongue Lizard. Picture Me: a Collaboration. Griffith University Art Collection. Bag It.